It is formed by a grid of different individual berries marched together and every individual scale is the end and the beginning of another berry. You probably did not know that besides berries you can use the whole fruit together with its peel. So, today we will reveal how to do this. But first, let me tell you more about this delicious and sweet fruit and the many health benefits that it can provide. Pineapple is a great source of manganese, vitamin C, dietary fiber, and an enzyme known as bromelain. The manganese is responsible for the defense of antioxidants while the vitamin B and Thiamine which are also found in this fruit have the ability to produce energy. This fruit is low in sodium and cholesterol, and has almost no fat, so this is the main reason why you should immediately include in your daily diet. 1 cup of pineapple pieces contains only 82 calories. Pineapple is abundant with bromelain, an enzyme that is mostly found in the core of this fruit. Bromelain possesses powerful anti-inflammatory properties and it is highly recommended for people who suffer from sports injuries. This fruit is a great source of vitamin C, a vitamin that is extremely effective for treating heart diseases. A number of studies conducted in China and Finland showed that the regular consumption of vitamin C can reduce the risk of coronary disease. As we said before, pineapple is rich in bromelain that it has the ability to fight cancer as well. 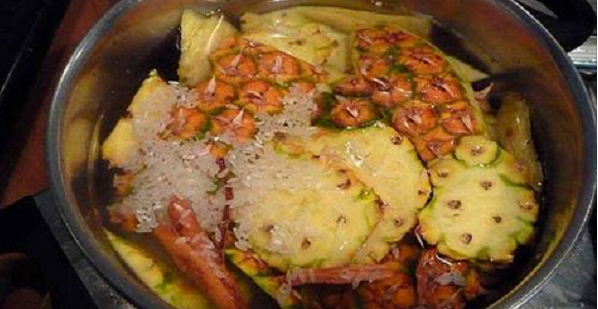 Pineapple works great together with chemotherapy and can effectively prevent the growth of cancer cells. It also contains beta-carotene that can protect the colon and the prostate from cancer. As we mentioned before, this super-healthy fruit is packed with beta-carotene that is converted into vitamin A during the digestion process. According to many studies, beta-carotene has the ability to reduce the risk of asthma. It is well known that vitamin C is extremely effective in protecting the vision. In fact, the regular consumption of vitamin C can reduce the risk of cataracts. Wash the pineapple and separate the peel from the fruit. Cut off the crown of the fruit and put the shell in a pan filled with water. Boil the shell with some pineapple pulp. Let the mixture cool then dilute it with 1 liter of water. In the end, you can add a sweetener for taste. Make sure to strain the mixture.